My brother gave me a gift certificate to Weir Crafts for Christmas. One of the items I purchased was a bag of doll skin scraps in assorted skin tones. I've only used skin fabric imported from the Netherlands and I wanted to see this American fabric. I also wanted to have some fabric to experiment or practice with that wasn't so precious as the rather expensive brand new tubes of imported knit fabric. This doll was all made with just the palest skin scraps. I still have some pale skin fabric left as well as lots of other skin tones from light tan to dark brown. That little bag of scraps was a great value! One the things I have really needed to practice is making heads. On my larger dolls I tend to get mixed results...sometimes they are perfect, other times the heads nod a bit (endearing but they aren't supposed to nod) and the neck is sometimes a bit wrinkled. So I've been making little heads and things have been looking up! (No pun intended)!! Josie, the doll above is 8" tall. 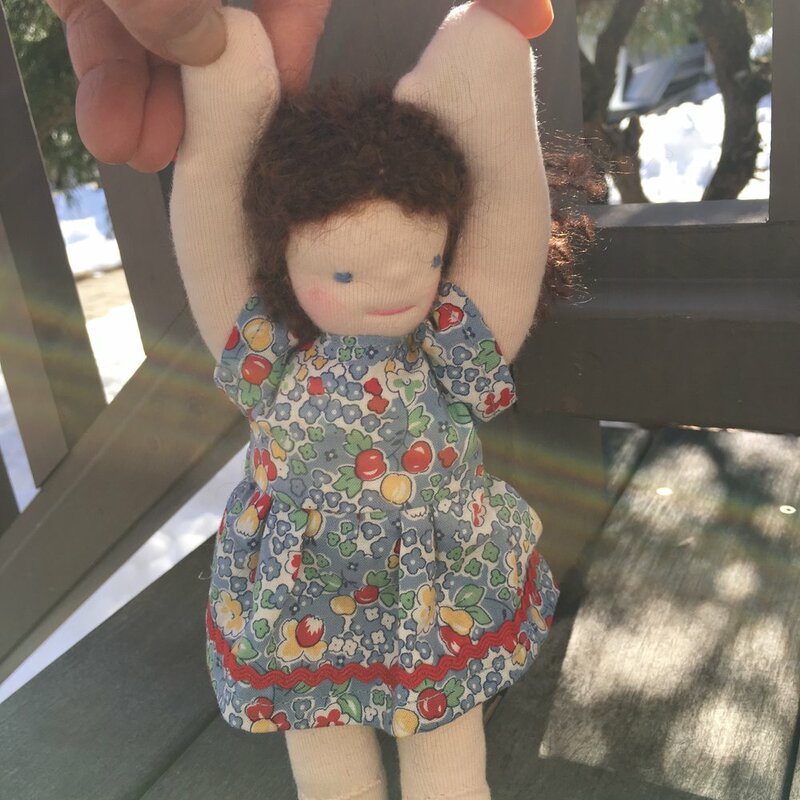 She is a very small classic Waldorf type doll with straight legs and outstretched arms. 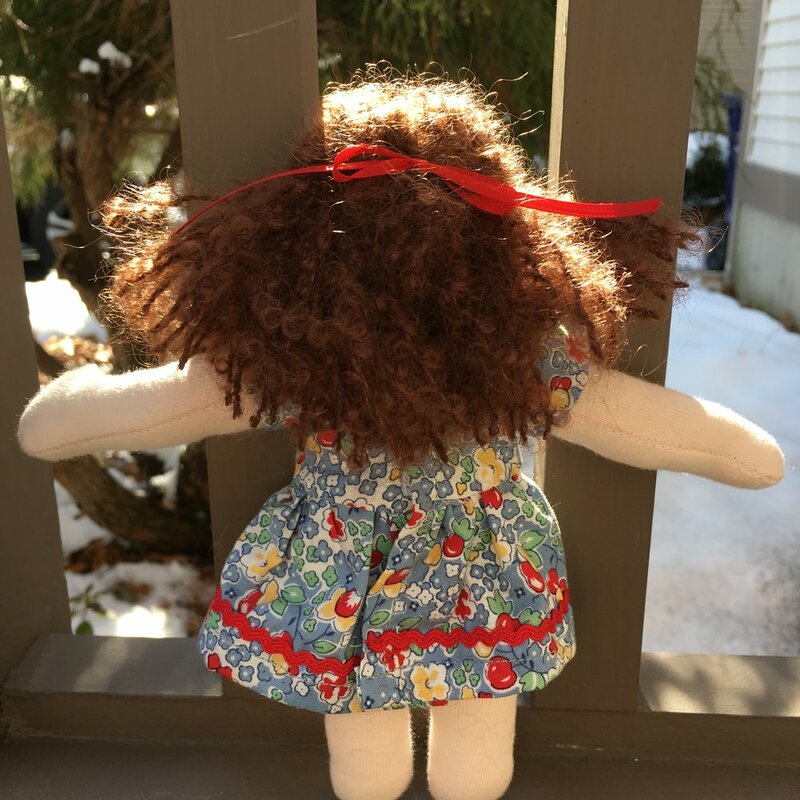 I used a pattern in the book Making Waldorf Dolls by Maricristin Sealey but decreased the pattern size 70% to match one of the heads I'd made. 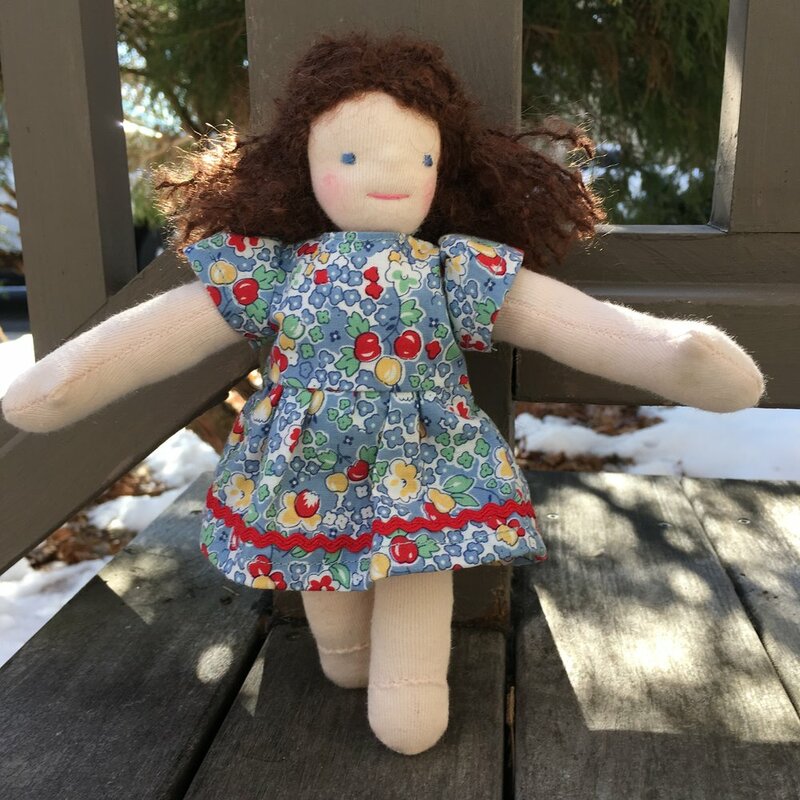 Her head is stable and they aren't any wrinkles, but when I make this doll again, I'll make the head a little bigger and the arms a bit shorter. But I do love that you can put this doll's arms over her head like a ballerina! Josie's hair is a brownish-auburn Victorian boucle from Halcyon Yarns that I purchased from Weir Crafts. I love how it glows in the sunlight! Her dress's fabric is a reproduction 1930's feed sack. It suits her perfectly! Love the light bouncing off her auburn boucle hair! In a couple weeks I'll show two other 8 inch doll make with the revisions I discussed above.